Natural Gas: Heating, Electricity, Industrial Use, Transport Fuel, Export, or All of the Above? Natural gas has always been easier to find and cheaper to drill for than oil, and indeed is often found with oil. If pipeline transport or markets are insufficient, co-produced natural gas is flared, as in North Dakota at present. In the energy market, natural gas suffers because it is less versatile—and less chemically complex—than oil and because it is less easily exported. Although oil is not exported, its products are. 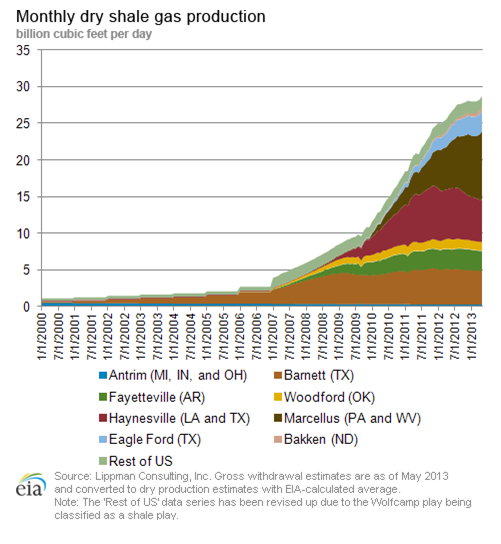 Last year the US used about 70 billion cubic feet per day (BCF/D) of natural gas. A spot gas price below $2.50/million British thermal units (MMBTUs) prompted substantial coal-to-gas switching at electric utilities. This led to a 13% decrease in carbon dioxide emissions. In a telling example of unexpected consequences, the decrease was enough to meet the Kyoto Protocol objective for 2020, had the US been a signatory. 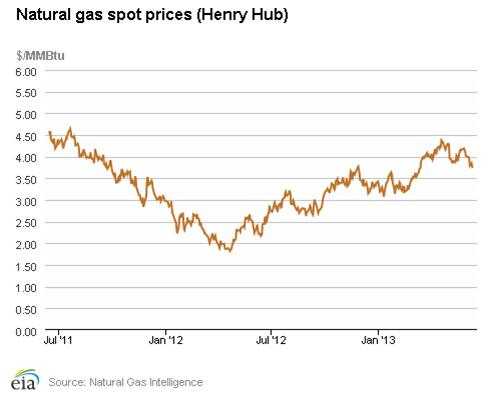 Long-term, wholesale US gas prices are expected to top out at $4.00-$5.00/MMBTU. For reference, the most recent close was $3.91/MMBTU, far more affordable to consumers than the $8.00/MMBTU average in 2008. Indeed, according to Liam Demming in The Wall Street Journal, "Bank of America Merrill Lynch estimates that the US paid only $76 billion for its natural gas in 2012, $140 billion less than in 2008-a savings bigger than the payroll tax cuts of 2011." A US gas wellhead price of $3.00-$5.00/MMBTU is much less than the $10-$13/MMBTU in Europe and up to $18/MMBTU in Japan. As discussed below, the consequence is more competitive US industries and a strong incentive to export. The US now produces twenty percent more natural gas than in 2006 and US potential gas reserves are up 26 percent in the last two years to 2400 trillion cubic feet (TCF), or 2.4 quadrillion cubic feet (to coin a new acronym: QCF). Of that, the total assessed shale gas resource is 1073 TCF, a little less than half. Note that the more economically-likely category of proved dry-gas reserves is an additional 305 TCF. This 2700 TCF total is ninety times what the US produced and consumed last year. Gas production is expected to continue to grow through 2040 at moderate gas prices of $4.00/MMBTU. The increase is due to horizontal drilling and fracturing in shale plays: shale gas production is now forty percent of the total, up from about 4 BCF/D in 2007 to 27 BCF/D at the beginning of 2013. For example, according to Oil and Gas Investor, in Pennsylvania's giant Marcellus field, natural gas production increased by 69 percent from 3.6 BCF/D in 2011 to 6.1 BCF/D in 2012 and is forecast by Barclays to be more than 10 BCF/D this year, about one-seventh of US gas demand. 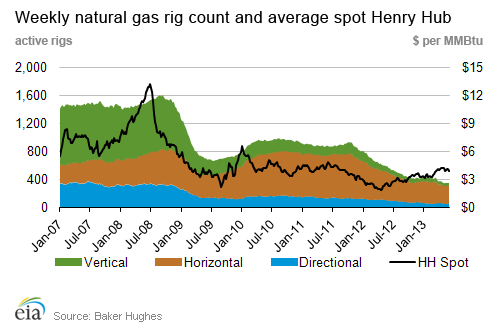 The graph below shows shale gas production growth. Energy consultant IHS estimates shale gas supports 1.7 million jobs today, with an increase projected to 4 million jobs by 2020. As Eric Penner of RBN Energy points out, all of this available production has flattened the forward curve for natural gas: whereas in 2006, there was s $2.50/MMBTU difference between July and January prices, last year—with a warm winter and lots of production--the difference was only $0.35/MMBTU. Gas production ramp-up and ramp-down in the US is seamless, though painful for producers. For example, Barclays notes the number of rigs drilling gas wells in the Marcellus field correlates closely to natural gas prices lagged by six months. Natural gas heats about half of US homes. Because it is cheaper, natural gas continues to increase its share of commercial and residential heating against electric-only and heating oil. Year-to-year use of natural gas for heating depends by the weather. Demand is directly affected by the number of winter heating-degree days. Overseas: The Fukushima flooding disaster in Japan led that country and many in Europe to slow or stop the production of electricity from nuclear power plants and then to require vast amounts of other fuels. At present, they have stepped up imports of coal and even wood, despite air quality concerns, because both are cheaper than delivered natural gas. According to Mari Iwata at The Wall Street Journal Japan spent 6.2 trillion yen on LNG in 2012-2013, up 75% from 2010-2011. US: In the US, when gas prices drop below $3.50-$4.00/MMBTU, electric utilities switch their combined-cycle plants from coal to gas. Clean-burning natural gas readily competes on price and environmental preference. Because gas prices were very low in 2012, around $2.00/MMBTU some months, a massive amount of coal-to-gas switching occurred. One beneficial side effect as we discussed in the third quarter 2012 report: cleaner air. Less coal means fewer particulates and fewer carbon emissions. Indeed, the International Energy Agency reported that for 2012, US carbon emissions declined from the previous year and were down 7.7 percent from 2006, the largest reduction of any country on the planet. Similarly, the US Department of Energy found carbon emissions in the US in the first quarter of 2012 were at the lowest point in twenty years. 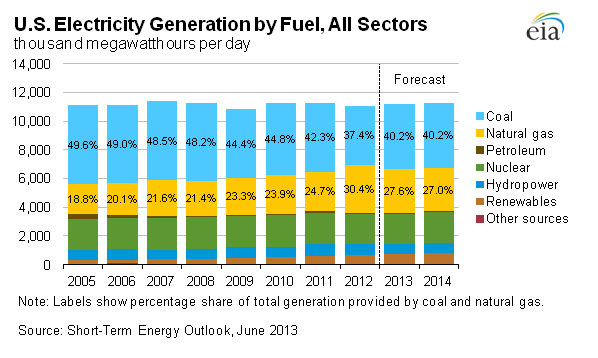 At present, natural gas fuels about thirty percent of electricity generation. Cheniere's Sabine Pass, the US LNG export terminal now closest to launch, was originally designed and permitted as an LNG import terminal. With a differential between US and Asian gas prices of up to $15/MMBTU, the $6.40/MMBTU cost to liquefy, transport, and regasify natural gas appears to be an easy call leaving plenty of margin. However, LNG plants are capital-intensive, requiring billions of dollars and twenty-year contracts for viability. And, the US is not alone in pursuing LNG exports: strong competition comes from (particularly) Australia with a capital investment of $60 billion in three new LNG trains online next year, as well as East Africa, and Canada. Additionally, traditional overland natural gas suppliers to Europe, like Russia's Gazprom, will fight to keep market share. However, LNG imports are welcome in European countries, where Russia's Gazprom has too long had a stranglehold, strategically cutting supplies when needed to remind countries of its monopoly power. Under US law, natural gas can be exported to countries that have a free-trade agreement with the US; exports to other countries—including energy-importing Japan--must be approved by the Department of Energy. Two LNG plants have been approved for such non-FTA export by the US Department of Energy. The first one was announced in 2011 by Cheniere Energy from its Sabine Pass LNG terminal in Cameron Parish, Louisiana. Its 2.2 BCF/D plant is expected to be online in 2015-2016. The most recent approval is for a $10 billion plan to convert a terminal on Texas Gulf Coast's Quintana Island to a liquefaction plant. Applications by a dozen potential US LNG exporters total 28 BCF/D. However, LNG exports are expected to ultimately reach only 6 BCF/Day by 2020, or 8% of current US gas production and 16 percent of global LNG production. A Deloitte study showed LNG exports would help global energy security and American foreign interests. The vast new supply of shale gas has jump-started about $100 billion in new petrochemical plant expansion along the Texas Gulf Coast, with natural gas serving as both fuel and—along with natural gas liquids—feedstock. One of the most recent ones was ExxonMobil's announcement of a multibillion-dollar expansion of its Baytown petrochemical complex. Expansions are planned at ammonia fertilizer, methanol, and steel plants. Natural gas is about 70% of the cost of making fertilizer and about 25% of the cost of making plastics, according to Ben Casselman and Russell Gold in The Wall Street Journal. In another example, Nucor and Encana have made a long-term agreement for an onshore gas drilling program that Encana will carry out to supply Nucor's direct reduced iron (DRI) plant in Convent, Louisiana, the first such plant operating in the US since 2009 and the world's second-largest, at 2.5 million tons per year of DRI pellets. Cheaper natural gas means cheaper electricity. The growth in jobs has been so significant that companies are hiring hundreds of new employees and funding technology-specific programs at nearby community colleges. According to Liam Demming at The Wall Street Journal, if natural gas could replace half of the major market for gasoline and diesel—transport—that, too would be a major market for natural gas, about 37 BCF/D. However, per an informal analysis by Tudor Pickering & Holt reaching this goal is unlikely; economics don't support the conversion cost, lower efficiency, increased driver training, range issues, engine performance concerns, slow refueling, and special ventilation/storage needed for maintenance. Still, oil drillers have begun replacing gasoline and diesel in transport and at well sites with natural gas. Producing company Apache estimates that this change lowers fuel costs by about forty percent. Replacing railway diesel of 3.8 billion gallons/year is also a goal, but a much smaller market; if all railway diesel was replaced by natural gas, the boost to demand would be only 1.5 BCF/day. CNG and LNG are replacing gasoline, diesel, and marine fuel in some places, particularly in fleets with centralized fueling stations, and environmentally-sensitive marine uses. The oil industry is slowly converting its diesel-fueled field fleet to CNG; however, many technical, infrastructure, and economic challenges remain. We have become used to thinking about the changes in geopolicy with increased domestic oil production. The same is true with natural gas. According to Kenneth Medlock III of Rice University's James Baker Institute, "There are three countries that benefit dramatically when you take shale out of the mix. They are Russia, Venezuela, and Iran. That's a mouthful from a foreign policy perspective." On a parallel track, L&L Dreamspell has just published Starks' second energy industry thriller, STRIKE PRICE. It's available in print and e-book editions from Amazon, Barnes & Noble, Kobo, and iBooks as well as by order from any bookstore. STRIKE PRICE is the story of a plot to sabotage a hidden, critical oil center and the woman who must save lives and stop it.